Fight Back Against the Plaque Attack! You know that fuzzy feeling on your teeth at the end of the day? Well, it’s not fuzz ,it’s actually plaque . What is plaque? It’s a sticky biofilm attached to your teeth containing hundreds of bacterial species. Before you run for the mouthwash, you should know those bacteria occur naturally. And it’s not just you, everyone has them! 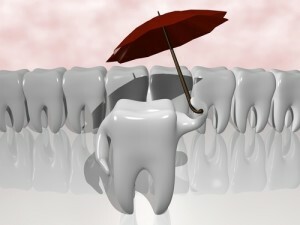 Those little germs on your teeth use ingredients in saliva to flourish, namely sugar. As the bacteria metabolize tiny sweet particles, they produce acids that erode tooth enamel, cause cavities, and lead to gum disease and tooth loss. A diet full of candy, soft drinks, and carbohydrate-rich foods ups the ante. Lose the Plaque, Not Your Teeth! Though the formation of plaque happens to us all, there are things you can do to prevent it from building up on your teeth and hardening into tartar. Brush thoroughly at least twice a day,for at least two minutes , but preferably after every meal. Floss once a day to remove leftover food particles and plaque between teeth. Chew sugarless gum in between brushing. When you chew, saliva is produced, which counteracts acid in the mouth. Limit your intake of sugary, starchy foods. Sticky snacks, like raisins, are especially problematic. Stop smoking! Do we really need to explain why? Besides the obvious reasons, smokers have more hardened plaque than non-smokers do. 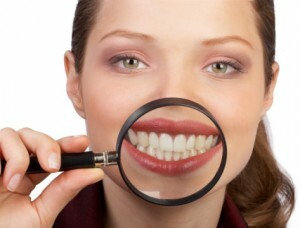 Visit your dentist every six months for an examination and professional oral hygiene visit. Ask about dental sealants, a thin plastic coating that protects the chewing surfaces of your teeth from cavities and decay. Changing your hygiene products and habits can have an enormous impact. Brush with a desensitizing toothpaste and always use a soft-bristled brush. Fluoride rinses can re-mineralize softened areas of tooth enamel and curb sensitivity. Daily flossing and regular dental cleanings will help prevent gum disease, and your dentist or Oral Hygienist can recommend other measures, such as a nightguard for teeth grinding. You don’t have to suffer tooth sensitivity. See your dentist for a thorough diagnosis and long-term solution. Drink your milk! How many of us immediately revert to childhood memories of sitting around the dinner table with mom and dad upon hearing these words? What if, instead, our moms had insisted, “Eat your cheese!”? I imagine we’d all have fonder dinnertime memories, for one. Well, it turns out Mom would have been doing us all a great favor if she’d been a little more generous with the cheese. Evidence indicates that eating cheese is beneficial for your teeth because it is low in carbohydrates and high in calcium and phosphate. Research over the past decade suggests that cheese is not only an excellent source of calcium, which (as we all know) strengthens bones and teeth, but can also help balance the acidity levels (pH) in your mouth preventing decay. While dairy products are chock full of bone-strengthening calcium, cheese goes the extra mile by coating your teeth with calcium. A single cube of cheese can increase plaque-calcium concentration by more than 100 percent! This coating aids in hardening and remineralizing teeth, which protects against cavities. Cheese not only acts as a delicious source of calcium, but it goes another step in fighting dental caries by balancing the pH levels in your mouth. When starchy or sugary foods and drinks are consumed acids are produced, causing pH levels to drop. A low pH level encourages demineralization, softening teeth and making them vulnerable to decay. Once again, cheese steps in to save the day! 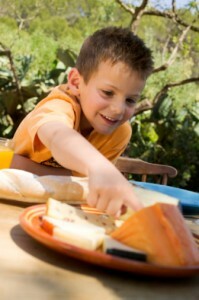 Studies show that eating cheese helps maintain a safer pH level for your teeth. What’s your favorite kind of cheese? Is it cheddar, Swiss, blue, brie, Gouda, or Edam? It’s been shown that just about any variety provides benefits to your oral health, so bring on the cheese and smile pretty! Don’t forget to brush and floss regularly. Teeth cannot live on cheese alone. If there’s one thing we all have in common fairly often, it’s that stressful situations can occupy our minds and sap our energy. Not only that, stress can actually compromise your health. If you are stressed, it’s more likely that you’ll grind your teeth during sleep causing tooth or muscle pain . While this bit of information has been around for a while, a recent study shed light on new piece of the teeth-grinding puzzle. Getting ready to welcome a new member into your family is an exciting time. Between much-needed rests (sustaining a growing baby saps a lot of your energy! ), you focus on all sorts of preparations. You’ll decorate the nursery, attend check-up visits and sonogram appointments with your doctor, and some unfortunate soul will be tasked with the job of putting together the baby’s crib. In the flurry of anticipation, don’t forget to take care of your teeth and gums. It’s likely more important now than ever to keep brushing, flossing, and visiting the dentist for preventive maintenance like professional cleanings and checkups. Studies suggest a link between gum disease and instances of premature births, as well as other pregnancy complications, so you want to keep a very close watch on your dental health during this most formative stage of your child’s development. Swollen, bleeding gums are a common complaint for pregnant women, and it stems from the higher progesterone levels in your body. The increase of this hormone means your gums are more prone to irritation from plaque, which can quickly cause gingivitis. Cleaning your teeth regularly, paying special attention to the gumline. This will drastically reduce the possibility for pregnancy gingivitis. Substituting more fresh fruits and vegetables, which are high in necessary vitamins and minerals, for processed, sugary sweets. It’s better for your overall health, too, not just your teeth! Asking your dentist when he or she recommends you schedule an appointment during your pregnancy. The best time is often during the second trimester. Every mom wants to give their little one the best possible start in life. Luckily, a few preventive measures go a long way in maintaining your smile and your new baby’s health, too. Talk to your general and family dentist about personalized treatment, and dedicate a few minutes each day to a thorough oral healthcare routine. It’s a small investment that pays big dividends! Parents have been telling their children to brush their teeth for at least 6,000 years. Archaeological excavations have uncovered evidence of ancient tooth cleaning implements, including twigs, feathers, bones, and quills. In fact, tooth brushing tools have been found as early as 3500 BCE in the Babylonian and Egyptian cultures, when people used frayed ends of twigs to scrub off bacteria and food particles. Several early cultures used chewing sticks with aromatic or antiseptic properties, such as neem or miswak. The sticks not only cleaned teeth, but also freshened breath. In 1498 in China, an enterprising soul plucked stiff hairs from a pig’s neck and attached the bristles to a bone or bamboo handle. When this toothbrush was adopted by the Europeans, they opted for softer bristles—using horsehairs or feathers. The toothbrush was modernized around 1780 by Englishman William Addis when he tied boar bristles into tufts and glued them into drilled holes of a bone handle. In fact, he’s responsible for the first mass-produced toothbrush. The company that Addis started more than 230 years ago, Wisdom Toothbrushes, still exists today. In 1857, H.N. Wadsworth was the first American to be granted a toothbrush patent. However, mass production on toothbrushes in the United States didn’t begin until 1885, and animal bristles were still used as the brushing components. Fast forward to 1938 when DuPont created a new material called nylon. 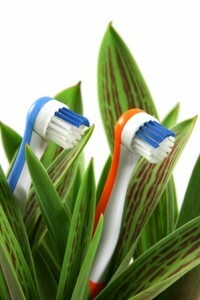 These synthetic fibers soon replaced natural bristles in toothbrushes. These days, you have a variety of toothbrush options, including electric and disposable. If you’re not sure which type of toothbrush is best for your dental care needs, ask your dentist at your next checkup. And skip the twigs.